DJI Mavic Air Review  Six Months later, is it still worth it ? Ever since DJI released their brand new Mavic Air model, it seems as though Spark and Mavic Pro went to the never-never-land. Their sales have been steadily dropping over the course of the last couple of months, all whilst DJI Mavic Air has been making quite the havoc out there. And it’s all for a good reason – DJI Mavic Air basically has everything the Pro has to offer with the addition of updated flight navigation system and QuickShots. True, its specifications cannot go toe to toe with those of Mavic Pro, but the smaller size and upgraded camera are more than enough to shift the odds in its favor. This, and much more you’ll find in our DJI Mavic Air review ! So now, almost 6 months after its initial release, it’s time to see has DJI Mavic Air managed to live up to its expectations and is it still the powerhouse in terms of portable drones as it was when it first arrived on the market. So, without much further adue let’s start off with the official specifications of this stylish little bugger! Back when DJI Mavic Pro hit the shelves, everyone was praising its sleek industrial design with sharp edges and high-quality build materials. It looked much different than both their Phantom and Inspire series – bringing a dash of fresh air to the market. However, when Spark came out it was criticized for looking too “childish” with its glossy plastic and unfoldable design. This time around, Mavic Air comes with a combination of glossy plastic and a rough industrial look, the biggest mark of the original Mavic Air. The hull looks absolutely amazing, sturdiness was definitely a top priority during the manufacturing process. There are several color variations available, but the one I fell for the most was definitely Flame Red. DJI Mavic Air Fly More Combo | Is It Worth It? Now the first thing we need to clear up before going any further is whether or not DJI Mavic Air Fly More Combo is worth the extra money. We have already seen these bundles with previous DJI models, both Mavic Pro and Spark have Fly More Combo options; so it’s not that big of a news in the first place. Keep in mind though, the price increase is pretty big… but definitely worth it considering the benefits it brings to the table. 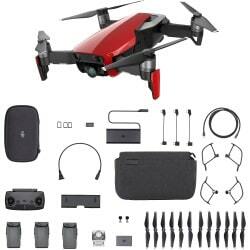 Not only will you get 2 extra batteries but the official foldable DJI Mavic Air controller, propeller guards, 2 extra sets of propellers and the charging hub as well. Traveling cases (one for the drone, another for everything else) are included in the package too, making DJI Mavic Air Fly More Combo the perfect option for people looking for a travel-friendly device. Well… it’s true, DJI Mavic Air is capturing smooth 4K footage at 30fps with bitrate going all the way up to 100Mbps. That’s quite the increase coming from DJI Mavic Pro with humble 60Mbps. 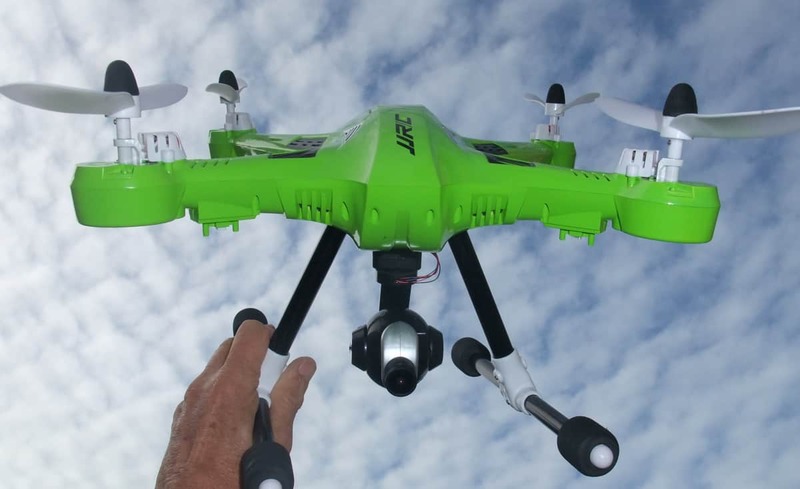 Cinelike and HRD compatibility is a pretty surprising feat of this drone. It’s not often we see these features being implemented in such a small drone, but it’s a change for the best as far as I can tell. As we already said above, DJI Mavic Air has a smooth 3-axis gimbal that works like a charm. It will provide you with buttery smooth footage and smooth vertical camera scrolling whenever you might need it. Performance | Right Between Spark and Mavic Pro? As far as performance is concerned, you’ve probably already heard that Mavic Air falls right in between Spark and Mavic Pro. As far as technicalities and specifications concerned, this is absolutely true… However, there are certain advantages that can be categorized as performance improvements which put to shame even the brilliant Mavic Pro. Higher video bitrate is certainly among them, and so are the newly added QuickShots, some of which are truly mesmerizing. More on that down below… For now, are we rightful to say Mavic Air is the Malcolm in the Middle of this story? Sure we are… but as you all know – not everything is black and white all the time! Flight modes are always right up there with the most essential aspects of every drone. Luckily, DJI Mavic Air doesn’t fail to impress us here with the standard set of features that come with both Mavic Pro and Phantom series. With that being said, Mavic Air has access to TapFly and ActiveTrack, along with a bunch of additional autonomous flight modes. The majority of those falls into the category of QuickShots, with the addition of several new names including Asteroid. These bring a dash of fresh air into DJI’s lineup and are certainly important traits of this little fella. Another thing worth mentioning is the fact Mavic Air sports a comprehensive obstacle avoidance system with sensors in the front, back and bottom part of the drone itself. They make up for an amazing extra level of protection and can be put in the same basket with systems of much pricier models. Return to Home is present as well, so no need to worry about if you lose signal to your drone at greater distances. Overall, as far as the software side of the story is concerned, there’s no doubt Mavic Air is as good as they get. DJI made sure of that and we cannot thank them enough! DJI GO 4 app works on both Android and iPhone devices. If you want more specific information, you’ll need an apple device with IOS 9.0 or later or an Android device with Android version 4.4.0 or later. You will also need a bit of extra storage space available for the app itself as well as cached video files coming in from the drone. Fly More Combo also gives you USB C, mini USB and lightning port for connecting any smartphone to the controller. If you are like me, then you like to take things the safest possible way… and that also means you’ll want to use your DJI Mavic Air together with the included propeller guards. However, keep in mind that this might cause an error to appear on your screen indicating you’re flying with an extra payload. It’s nothing to be worried about though, propeller guards won’t affect your drone’s performance at all, so rest assured your footage is safe and sound. The hardworking folk over at DJI have done a great job with the original controller for their Mavic Pro model. The Spark took it to the next level… and now the same thing is happening to that of Mavic Air as well. It shares roughly the same shape with dual antennas at the top and a foldable body for easier transportation. If you opt for the Fly More Combo, the controller will fit snugly into a dedicated compartment of the big carrying case you get with it. As for the buttons, the situation has remained pretty much the same with just a couple of minor tweaks. Both analog inputs now have detachable sticks which help with cramming it in tight spaces. Overall, the build quality is superb and it can even charge your smartphone! Conclusion | Is DJI Mavic Air still the ultimate mini aerial photography drone out there? Of course, I am talking about the recently announced Parrot Anafi which seems like it’s going to be a true direct competitor of the Mavic Air. 4K videos, HDR capabilities, and 3-axis hybrid stabilization are bound to make an impact. What do you think? Will Parrot Anafi steal the title of the best miniature camera drone from DJI Mavic Air? Let us know in the comment section below!